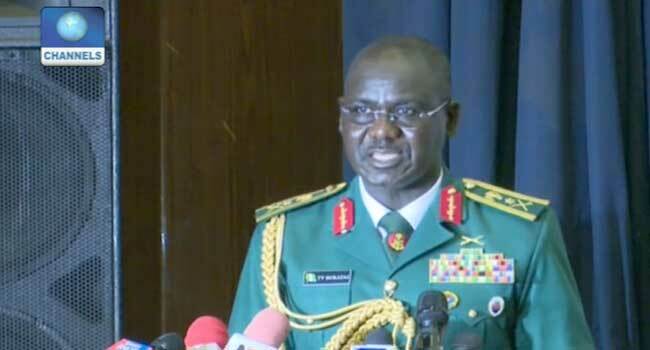 The Chief of Army Staff, Lieutenant General Tukur Buratai on Monday said it will require collaborative efforts to combat Boko Haram insurgency in Nigeria. Buratai said this while addressing top military chiefs during the African Land Forces Summit in Abuja. The conference is co-hosted by the United States and Nigeria and aimed at boosting cooperation between countries fighting extremist groups. The COAS said although Nigerian Army has recorded significant success in taming the terrorists, it still require collaborative efforts to ensure safety and stability in Africa and in the world. “Nigeria has recorded significant progress in taming the excesses of the Boko Haram terrorist group. “It is my view that combating the menace of Boko Haram and other extremist organisations will require collaborative efforts, therefore, I want to emphasise that our collective action and inaction will have an impact on our efforts to ensure safety and stability to our individual countries, Africa and the world in general,” he said. Buratai said the African continent is faced with terrorism, the proliferation of small arms and light weapons, piracy and human trafficking. These security challenges, he said, exists in the African continent with rippling effects, across the globe. The Nigerian Army, according to him, is, however ready to take the lead role in combating these challenges and ensuring peace in Africa. “Let me at this point reaffirm the Nigerian’s Army unflinching to take lead roles in Africa and towards ensuring peace, security and sustainable development. He appreciated the government of the United States and the United States Army Africa for giving Nigeria and the Nigerian Army the right to co-host the summit and for initiating and sponsoring the summit and explained the purpose and expected the effect of the summit on the African continent. “The African Land Summit is the Single largest gathering of the African Senior Military leaders and other Senior Army Chiefs from across the globe, especially within the African continent. “The Forum affords the African countries the avenue to share experiences on global terrorism and to forge a common approach to combating transnational threats and crimes such as violent extremism, organized terrorism, armed proliferation, among others. “The Summit also affords military leaders the opportunity to interact with the aim of strengthening existing relationships and developing new ones,” he explained. The Army Chief said he has no doubt that the summit will present ideas and ways to tackle numerous challenges bothering on security and military professionalism. Military top officials from across Africa on Monday kicked off the African Land Forces summit which is co-hosted by the United States and aimed at boosting cooperation between countries fighting extremist groups. Military leaders from almost every country on the continent including Angola, Cameroon, Egypt, Kenya and Rwanda are in Abuja for the summit.